Sugar Swings! 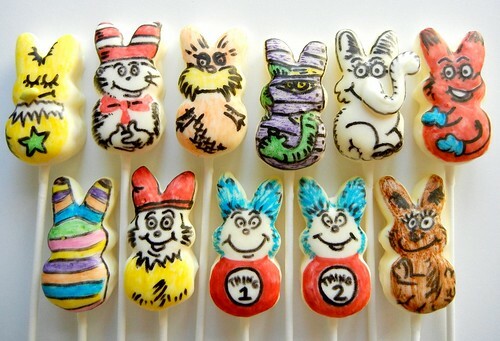 Serve Some: dr. seuss peep pops.....! .....so i loves me a good mash-up!.....being a pinterest fanatic like so many others....there are always some good mash-ups over there....like these....muppet/superhero...or...dr. who/seuss...or....star wars/calvin and hobbs...or...pulp fiction/simpsons....the list goes on and on....!....love them all! ...actually i've done peep pops before because they are so easy here....buy some peeps....dip in candy wafer/chocolate/almond bark (whatever is your hardening candy of choice)....and add some fun decorations.....and since we have some pretty serious star wars fans over here i mashed them it up with peeps ....and made some peep troopers too....! ....and you get a bunch of really fun dr seuss peep pops to celebrate the wonderful joy he's been bringing kids for ages!.....the lorax of course is probably my fav story (can't wait to see the movie! )....although it's hard to pick a fav....fox in socks was a fun one too....and the sneetches story is just great....i think my fav pop is the once-ler up in his lurkdom....i love how he came out! ....you could also use them as cupcake toppers as well....! .....we also recently visited orlando's islands of adventure which has a dr seuss section (seuss landing)...which the kids absolutely loved!...if you have little one's (mine are 7 and 4 year old twins) and will be visiting orlando....definitely go there.....it's done very well....not to mention it has the wizarding world of harry potter too....majorly cool if you are a fan and want to get yourself a wand and some butter beer! 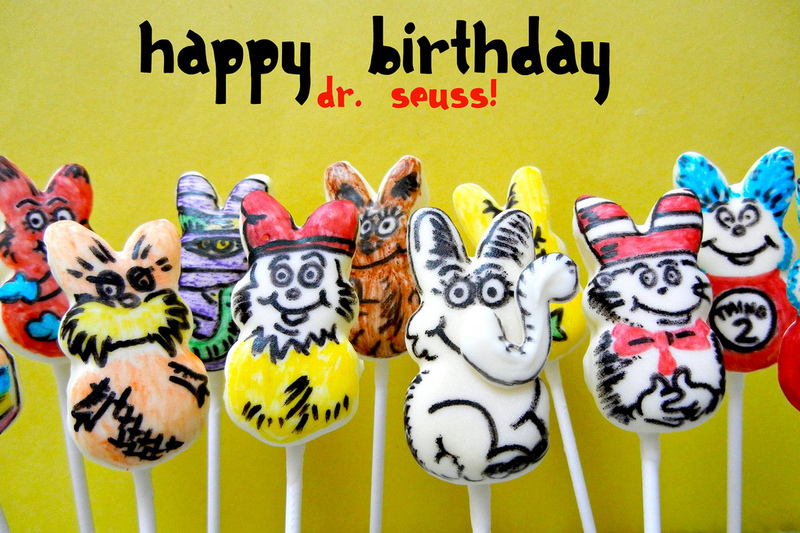 ....happy happy birthday to dr seuss!....and thank YOU for stopping by.....have a very awesome week!...and let me know which seuss pop is your fav! Oh my goodness...how adorable! You did a great job on these!! So clever, original, and beautifully done. Wow! Beyond creative! You did an amazing job on these! Bravo!!! Love the Dr. Seuss Pops! I have never seen these before! Great idea! SO adorable. How creative! What a great idea to change up the Peeps. You are so talented. 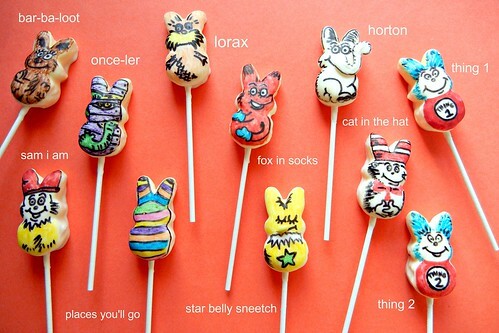 Your Dr. Seuss pops are really little works of art on Peeps. What could be better? I can't get over how awesome these are! BEsides a fabulous idea how you executed it was over the top wow! Horton!!! I just love him! these are absolutely amazing! Great twist on the idea! How adorable!! Loooove this, and all of them really have that Dr. Seuss character! Nicely done!!! Omg, you have got to be kidding me, these are just awesome! Where did you get your edible markers? The only ones I can find do not work very well..
thank you! some food writers are better than others....i did most of this with americolor food writers http://www.amazon.com/Gourmet-Writer-Decorator-Assorted-Colors/dp/B0012DMI1S , the wilton ones don't work for me on candy melt--i also just got a duff brand...some worked but some did not...not sure why....anyway, thanks and GL! So cute and fun! I don't think I would have the talent to draw like that:P You did an awesome job! Those are incredible! You are so talented I would love for you to share at Bacon Time's weekly Anything goes fri-monday linky. These are each a work of art. Must have taken so much time. Adorable results. Those look amazing! You are so talented! This is just adorable! I found you via Kitchen Fun with my 3 Sons and am a new follower. I'd love for you to link this up to this week's Dr. Seuss theme at Thematic Thursday on DianaRambles.com. Dr. Seuss would be grinning ear to ear with these!